In experiments, including those at the University of Greifswald, researchers are testing which material can generate spin current most effectively. Electronic devices such as computers generate heat that mostly goes to waste. Physicists at Bielefeld University have found a way to use this energy: They apply the heat to generate magnetic signals known as 'spin currents'. In future, these signals could replace some of the electrical current in electronic components. In a new study, the physicists tested which materials can generate this spin current most effectively from heat. The research was carried out in cooperation with colleagues from the University of Greifswald, Gießen University, and the Leibniz Institute for Solid State and Materials Research in Dresden. 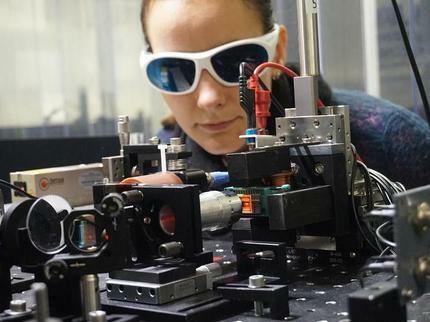 The Bielefeld physicists are working on the basic principles for making data processing more effective and energy-efficient in the young field of 'spin caloritronics'. They are members of the 'Thin Films & Physics of Nanostructures' research group headed by Professor Dr. Günter Reiss. Their new study determines the strength of the spin current for various combinations of thin films. A spin current is produced by differences in temperature between two ends of an electronic component. These components are extremely small and only one millionth of a millimetre thick. Because they are composed of magnetic materials such as iron, cobalt, or nickel, they are called magnetic nanostructures. 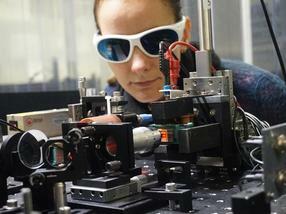 The physicists take two such nanofilms and place a layer of metal oxide between them that is only a few atoms thick. They heat up one of the external films - for example, with a hot nanowire or a focused laser. Electrons with a specific spin orientation then pass through the metal oxide. This produces the spin current. A spin can be conceived as electrons spinning on their own axes - either clockwise or anti-clockwise. In their new study, Dr. Alexander Böhnke and Dr. Torsten Hübner together with their colleagues Dr. Timo Kuschel and Privatdozent Dr. Andy Thomas tested different combinations of ultra-thin films. Each time, they heated one of the external films in the same way. 'Depending on which material we used, the strength of the spin current varied markedly,' says Böhnke. 'That is because of the electronic structure of the materials we used.' Based on theoretical assumptions, the researchers were able to find suitable materials possessing the appropriate electronic structure. The measured strength of the spin current was up to ten times higher than that obtained with previously used materials. According to the researchers, magnetic nanostructures with special combinations made up of cobalt, iron, silicon, and aluminium were particularly productive. The experiments conducted by the Bielefeld physicists were the product of a close cooperation with the team headed by Professor Dr. Markus Münzenberg from the Ernst Moritz Arndt University in Greifswald and Professor Dr. Christian Heiliger from the Justus Liebig University in Gießen. Dr. Andy Thomas started his research on this topic at Bielefeld University and is now continuing it at the Leibniz Institute for Solid State and Materials Research in Dresden.